I'm giving my ice cream maker a workout these days since it's been so muggy and hot lately. To use up some strawberries I picked at a local strawberry field recently, I made this Strawberry Cheesecake Ice Cream. Hello, yumminess! Now this is an ice cream that any cheesecake lover can appreciate! There have been a few cheesecake ice cream recipes I've come across but I went with David Lebovitz's recipe since he's the king of ice cream recipes in my book! His recipe is decadent and rich, just as ice cream should be. Unlike many of his ice cream recipes, this one doesn't require any cooking, so it's a quick and easy recipe to make. Cream cheese, sour cream and half & half are combined with sugar, lemon zest and a pinch of salt to create the cheesecake ice cream base. This mixture is churned and once that's done, a simple strawberry sauce is swirled in. For additional texture, I added chopped strawberries as well. Zest the lemon directly into a blender or food processor, then add the cream cheese, sour cream, half and half, sugar and salt and puree until smooth. Chill the mixture thoroughly in the refrigerator, then freeze it in your ice cream maker according to the manufacturer’s instructions. Place half of the ice cream in a container, then spoon in some of the strawberry sauce; repeat layers, then gently swirl with a spoon. Store in the freezer until ready to serve. To make the strawberry sauce, puree the strawberries with the sugar and lemon juice in a food processor until smooth. Press the puree through a strainer to remove the seeds. Wow. That looks absolutely stunning! That beautiful picture is totally making me drool!! yum! love the cream cheese and sour cream! This looks absolutely heavenly!! 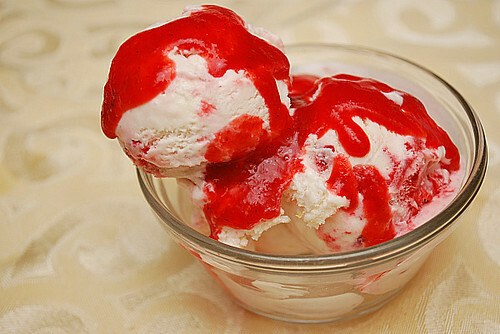 I love strawberry drizzle on ice cream. Add Cheesecake? Yes please!